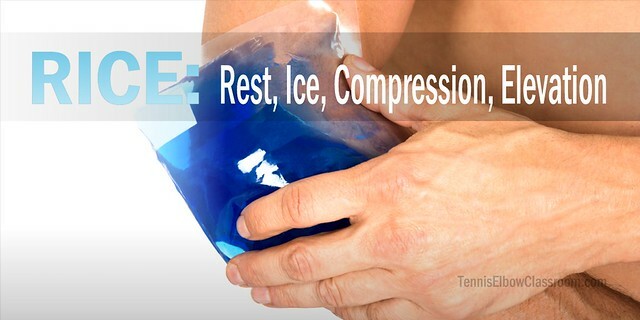 Don't Use Ice to Treat Your Tennis Elbow! 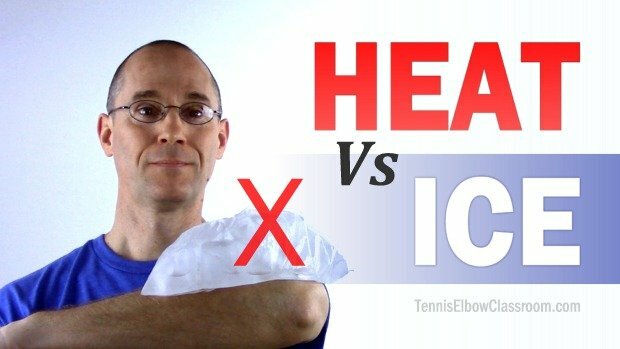 Should you use ice to treat your Tennis Elbow? (Or Golfer's Elbow?) - No. Here's why you should consider using heat instead - Or at least stop the constant icing! Am I joking!? – What about the inflammation? you're probably wondering... All the medical websites and authorities say I should ice my Tennis Elbow to reduce inflammation! Could they all be wrong? What happens, any time you injure something, is that the healing process kicks in and inflammation is the first step in that process. BUT, 'Acute Injuries' are almost always sudden, traumatic injuries, often involving some bruising or tearing – like a sprain or a strain. And, although Tennis Elbow can sometimes start out this way – Most of the time it creeps up on you – It’s usually a sneaky, gradual breakdown. Have you ever sprained your ankle badly – or seen someone who has? Let me repeat that “swelling” is the bad thing here. It means there’s too much fluid building up in the area. And you can tell because it puffs up visibly and also feels kind of spongy when you press on the area. And that’s not a good situation because it means the area has gotten all clogged up and congested – and your circulation has slowed way down – It’s bad because you need good circulation for healing! Swelling is NOT the feeling of tenderness, soreness or pain OR the presence of redness you can see in your skin – Although those symptoms often go along with it. So, the question is: Can you see any swelling around your elbow? Does it feel significantly puffy to your touch in that area? Now, I’m not trying to diagnose you here, but if you don’t see it, there’s probably no significant swelling you need to be worried about. And icing won’t do a thing for you except make your pain feel a little better for a little while. Of course that’s better than popping anti-inflammatories – BUT the bottom line is, it won’t help you heal any faster, and if you do a lot of icing – It may slow your healing down! As a side note, I’ve been treating Tennis Elbow cases frequently for at least seven years in my practice, and I can’t remember ever seeing one person who had any significant swelling around their elbow. One of the most visible (and quoted) sources is the Doctor who coined the RICE acronym in the first place, who has since radically changed his position on it. Anything that reduces it also delays healing! "You cannot have tissue repair or remodeling without inflammation,"
"Ice constricts blood flow and impedes the inflammatory cells from reaching injured tissue." I was also delighted to see that Gale Bernhardt, the U.S. Triathlon team coach at the 2004 Athens Olympic Games, seems to have also "switched sides" and now plays for the "RICE is wrong" team, according to her article on Active.com, where she references both Gary Reinl's and Dr. Gabe Mirkin's books. Inflammation is the first step in your healing process – And you can’t have any healing and repair if it doesn’t happen. That’s why, in my opinion, I think it’s best not to ice at all, unless there’s obvious swelling. If you’re tired of chasing your Tennis Elbow symptoms around in a vicious circle following the latest remedy, trick or cure – You’re in the right place to get the big picture, to understand how your healing process really works, and learn how to help your injury finally heal. You’ll learn all the therapy techniques, key stretches AND essential exercises you need to treat and recover from your injury at home. I just watched your video and it all makes sense to me. 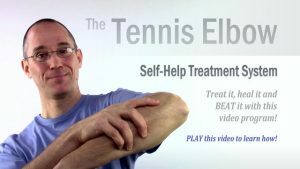 I have started to suffer a little from tennis elbow symptoms and am hoping to nip them in the bud so I’m keen to do the right things and avoid doing the wrong things. My wife has had bad tennis elbow for a long time and has been resting and doing exercises for 5 months now but is still not completely better. I don’t want to go down the path she has been on! I’ll look at the other free info you offer and see where we go from there. Thanks. By the way, your website looks very professional. Well done. Thanks for the compliment, Jonathan! I’ve put a lot of work into The Classroom and I hope you find what you’re looking for here. I have tennis elbow because I play tennis. I have undergone ultrasound therapy, ice therapy, braces, exercises, and gel. I have a physiotherapist who has asked me to do all this. I have been doing all this for a week. The pain has subsided significantly, but I have a feeling it will come back. I am ready to enroll in your program but I have a question. Can I start playing Tennis right away, and be in your program at the same time. I can bear the slight pain, and discomfiture, because my tennis elbow got diagnosed at a very early stage. I would like to have your comment. Hi, I practice martial arts, so my elbow is extremely important! I have found your information very helpful in the healing process..I have basically been leaving it alone, while still exercising and not doing certain things to aggravate or re-injure it. (Punching bag, dumbbells, etc.) I haven’t seen anything about heat…should I apply heat or just leave it the hell alone? Sorry for the late reply, Laura. Thanks for asking! (I’ve been so single-minded in finishing the Golfer’s Elbow Program this past month.) I do like heat for chronic tendon problems, so as long as it’s not an Acute Injury then it should be safe to apply some heat to it. Hi, I don’t know what is wrong with my elbow, I am 13 years old. Hi, so I play a volleyball game tomorrow, and we won’t make tournaments if we don’t win both games. This is very important for our team and if I don’t play, then we have a very high chance of losing. So today my arm just started hurting randomly in school, and I didn’t really do anything with it. Do you have any suggestions what to so to make it feel better? I need it to be a little better to be easy enough during the game tomorrow. In school I couldn’t even pic up a small paperback novel with that arm, it hurt so bad it fell on the floor when I picked it up. It feels twisted weird and it hurts to close the car door and picking up light things. Any suggestions? My dad said never to ice it, he is a highschool health teacher and coach. It also feels like I might have stretched something g in there. I can’t get a brace, they won’t let me wear them in games, and I can’t see the doctor because my parents said it was minor. Any at home things u can do to help heal up a little before our game? Please answer fast! I need an answer by early tomorrow! Sorry! Hi Allen, how about heat? 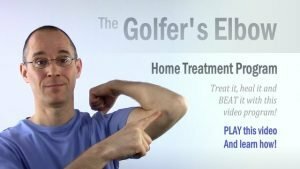 I have been trying to apply heat to my golfer’s elbow 15 minutes 1-2x daily to increase blood flow. What are your thoughts on that? I think that’s a great idea, Shawn. I like heat for chronic tendon problems. my daughter has had tennis elbow for two years off and on with cortisone shots aND TWO mri’s then went to a chiropractor for the voo doo flushing and nothing has worked she still has pain. she has rested it for 6 weeks doing exercising with a book I bought just for tennis elbow please help any suggestions. Hi Patra, How many Cortisone shots has your daughter had? (Two is significant and three or more is a really big deal in my experience) And what were the results of those MRIs? Hey I’ve been dealing with outside elbow pain for about 4 months now. It first started from baseball (throwing). I’ve just recently been applying heat 1-2 times a day and then stretching immediately afterwards. I’ve also been doing forearm strengthening 3 times a week and trying to lift in the gym 3-4 times a week. I guess my question is, when could i start throwing again and lifting aroung 6 times a week which is my usual regime? Also is this something that im going to have to deal with my whole life or is there a way to cure this 100% after a while? i know its tough to answer these questions when you cant diagnose me in person but i’ll thank you in advance. Hi Cameron, Thanks for stopping by. I know 4 months probably seems like forever to you when elbow pain is coming between you and the things you want to do, but don’t worry, that’s not actually a long time when it comes to Tennis Elbow – and it’s unlikely that you will have to deal with it your whole life. Can You Still Workout With Tennis Elbow? Hi Cameron, thanks for your articles ! I have tennis elbow (or sometimes if feels like it is at front also ie golfers elbow) but not from repetition but from dog bite where his teeth locked into all the little nooks n crannies of the elbow bone, and damaged the tendon – the doc said tennis elbow. Everyone is giving me conflicting info about treatment which is very confusing. 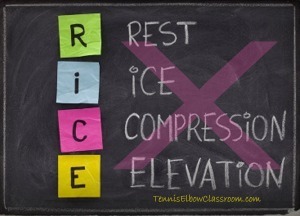 I started with brace which did abs nothing, then warm pack then was told should be ice bc all sports people etc when have tendon/muscle injuries use ice & to reduce swelling etc….your article made a lot of sense thanks ! so i am thinking will go back to heat. Altho I did read you mention heat not good if a trauma injury, so if ice nor heat any good – is there an alternative?? I take some anti-inflammatories but they do not appear to help at a lot (I still take them at the moment). Maybe I should just persevere & let body heal itself, its been 4-6wks now. thanks . I rock climb A lot. I developed bad golfers elbows in both arms. My PT told me I wasn’t stretching enough and he did normal pt tendon stuff, which I did for a few months. I went about a year not using ice and focused on only stretching and exercises. Time off from climbing helped a little but my problems never really went away. I switched to ice dips and Anti-inflammatory pills and my right arm has totally healed and I’m back to climbing. My left arm is still there but I feel like its managable and getting better. I don’t ice dip my right arm anymore. Maybe this article is or isn’t the way to go for people but I can tell you from my experience: Ice dips, anti inflammatory stuff and stretching have yielded the best results, for me. This is all very interesting. The good news is that medical professionals are starting to get the message. I am in Nurse Practitioner school, and my textbook says exactly what you are saying above. Basically, that tendinitis and tendinosis are completely different, and with “osis,” the problem is collagen breakdown which needs to be re-built over a long time, and that RICE won’t help. At least the medical professionals who are currently in training should have this info! Thanks for sharing that, Sarah! So glad to hear they’re making that key distinction. At least the next generation of medical professionals may start to change the standard protocol now! I’ve been a hairdresser for 16 years and 12 weeks ago my elbow started hurting. I’ve tried acupuncture, steroids, chiropractor, Rolfing, exercises, oh and had a cortisone shot which did nothing but turn red and was bruised. Also have tried the ice dipping in my sink, which was painful to me!!! Wow!!!! Have also don PT with ultrasound. I have to work bc if I don’t work I don’t get paid. I’m a single woman so you know the rest of the story:) at first I put heat on it for a couple of days and saw no relief. The ice only numbs it to be honest. I have had swelling in my arm. My c5 c6 are messes up, so I also have neck and shoulder issues. So I have a double whammy going on. I’m sitting here right now with the heating pad wrapped around my arm, hoping it will help. The pain is debilitating and I just want it to go away!!!!!! I’m doing exercises for my neck and shoulders. All I know is I can’t have surgery bc I have no health insurance. It cost 220.00 for the cortisone shot😳. Don’t want another one. I’m 53 and feel like I’m falling apart. Any words of encouragement? Doesn’t getting down inflammation to a point enables blood to flow through more effectively. I just started a treatment that does promote the blood flow, but is advised to use cold when needed. For example, I really over strain it one day I should go back to cold. I understand the purpose of inflammation but also think the treatment I am doing makes sense. If it is on going problem, reduce the inflammation when it comes up then consistently promote the blood flow. It is more effective that way. Am I wrong? I like the concept and the theory makes more sense to me. Thoughts?